We’d love your help. Let us know what’s wrong with this preview of Rachel Spinelli Punched Me in the Face by Paul Acampora. To ask other readers questions about Rachel Spinelli Punched Me in the Face, please sign up. This is the most amazing book so far. It is funny and incredible. Rachel is very aggressive while Teddy is very soft and somehow needed to be watch out. And Zachary is the new boy who plays trumpet. This story is really funny. Paul must be really amazing to write a story which is soooo funny like this one. I sincerely enjoyed this well crafted, well rounded novel right from the get go. A cast of inventive characters had me laughing out loud one minute, and pausing to re-read a beautiful moment the next. The bit of wisdom I took from this one? - Life is full of change, so let it flow and see where this magical river takes you. Another plus - I could hand this book to any of the kids in my life without a breath of hesitation. Thank you for that! The main character's mother leaves the family at the beginning of the book and he's dealing with the hurt of that, as is his father. Although a missing parent is often overdone in literature for this age level, I think the treatment here is natural and handled well. I believed in the community members. I like the idea of books that show all kinds of people who interact with each other - not just the ones who are your age or who happen to live in your house. Sometimes these attempt fall flat - creating eccentric neighbors and so forth, but this one adds a bit of flavour without going too much into detail about the supporting characters. I like the relationship between Zachary and his father. I also like how music is a tie between them (and also to Teddy) - and the music connection isn't fake: the writing reveals an understanding about musicians. I wish Rachel were a bit more funny. She's set up to be big bad Rachel, and we learn the reason why, and we have a fair amount of reasons to want to like her, but she's just not as compelling as she needs to be to propel the book. If she had some major talent or ability, or her insults popped a little better, it would give her more edge. There's a little too much telling about how mean she is, so the showing falls short - her fury seems a bit pale. I'm all about sitting around and thinking about who people are and why they do what they do, and even I think the characters spend an unrealistic amount of time discussing who they are and why they do what they do. Fortunately, it's usually interesting, but it stretches believability a bit for them all to be able to articulate these insights and be willing to share them so regularly. Loved, loved, loved this book!!! It’s like if the books Stargirl and The Tiger Rising had a baby. I loved this book and will totally recommend this to my students. Especially to the boys. 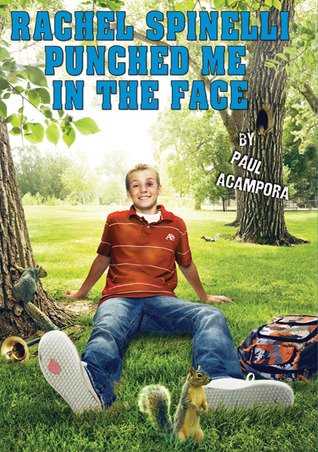 Really fun book for 5-8 grade boys. Love the theme of being friends with all sorts of people, living in a small town, and getting through a parents divorce. "'You can have more than one best friend,' I told her. "'You can have a best boy friend, a best girl friend--'"
This was actually much better than I expected. I found this story to be charming and easygoing. I can't really say I laughed out loud...but I did chuckle a few times. 1. Boy read. Good for boys...good boy narrator that is smart and clever and sweet. 2. Clever, easygoing, charming conversations. This book, like some ya's has a ton of conversation in it. But at least these conversations we're pretty entertaining to read. And to me, they sounded authentic...rather than making me feel like rol This was actually much better than I expected. I found this story to be charming and easygoing. I can't really say I laughed out loud...but I did chuckle a few times. 2. Clever, easygoing, charming conversations. This book, like some ya's has a ton of conversation in it. But at least these conversations we're pretty entertaining to read. And to me, they sounded authentic...rather than making me feel like rolling my eyes every other page. 3. Strong, supportive father figure. That was different and appreciated. The dad in this book was awesome. In fact, all of the adults in this book, with the exception of the boys mother are portrayed very favorably. It was refreshing to say the least. 4. Lower reading level. This book should appeal to reluctant readers, readers who want to make sure they get a ocean book, and Tweens or juveniles that want to start reading teen fiction but don't want anything too advanced. Zachary and his father live in a rusted out trailed in Colorado, but after Zachary's mother runs off to work on a cruise ship, the two decide to move to Connecticut, where Zachary's father gets a job as the local policeman. The Spinellis are new neighbors, and Zachary soon takes to Rachel, even though she is harboring a lot of anger about her developmentally delayed brother Teddy and has a habit of getting into fights. There are many interesting people in town-- Rachel's family runs a diner in town (where her mother's ashes are kept in a coffee pot), there is a local ice cream parlor run by a Polish couple, and the mayor and teachers are friendly and accessible. Teddy, Rachel and Zachary spend the summer hanging out together and getting into various scrapes. When Zachary's mother wants to come back to visit, Zachary is enjoying his life so much that he doesn't want to see her. Strengths: Nice humorous book with a romantic interest. Small size and funny cover will encourage boys to pick this up. Weaknesses: There is great character development, but the plot suffers because of it. At first, the book is one introduction to a new character after another. This quick read is jam packed with great snippets. Zachary and his dad are alone now- Mom decided to follow her dream to work a cruise ship and took off one morning. Now the men of the Beatrice family must decide what to do. "What do you want?" I asked my father. "I want us to be happy." he told me. ......"Happy would be nice," I said, "let's try it." So the duo are off to Falls, Connecticut. Zachary to high school and Dad as the police officer of the small town. This quick read is jam packed with great snippets. Zachary and his dad are alone now- Mom decided to follow her dream to work a cruise ship and took off one morning. Now the men of the Beatrice family must decide what to do. So the duo are off to Falls, Connecticut. Zachary to high school and Dad as the police officer of the small town. As they settle into the warmhearted town with its wacky cast of characters Zachary finds friends and very, very slowly approaches the tender beginnings of coming to grips with his anger at his mother. In the meantime he befriends Teddy a boy with Trumpet playing superpowers and Rachel, Teddy's hyperprotective sister who are coping with a different kind of loss. Zachary and his dad move to Falls, Connecticut, to start over after Zachary's mom left. Zachary is looking forward to the change. Life in Falls, Connecticut is very different. First, they live in a house, not a trailer. Everyone knows everyone else. Then there's Rachel Spinelli. Rachel, her dad, and her brother Teddy live across the street. Rachel wants Zachary to know to treat her brother right. Teddy is special, but Zachary doesn't mind spending time with him and being his friend. Nothing is wha Zachary and his dad move to Falls, Connecticut, to start over after Zachary's mom left. Zachary is looking forward to the change. Nothing is what he expects and even when his mom shows up does Zachary know what he's in for. But Copper Canyon, Colorado, is a bleak place with unhappy memories. This is the town where Zachary’s mom abandoned her husband and child to pursue her dreams of travel and excitement. So the two head for Falls, Connecticut, where Zachary enters high school and his Dad becomes the police officer for the small town. Falls is populated wit "What do you want?" I asked my father. Kind of a "glossy" approach to big changes like mom leaving and moving across the country, but you take an instant liking to Zachary as well as Rachel and her brother. "Zachary’s mom just up and disappeared from their home in Copper Lake, Colorado. The good news is that Zachary and his dad are trying to move on, and Falls, Connecticut, is just the place for a fresh start. With the help of a new friend, Rachel, and her brother Teddy, Zachary is learning about new beginnings, the power of forgivene Kind of a "glossy" approach to big changes like mom leaving and moving across the country, but you take an instant liking to Zachary as well as Rachel and her brother. I just finished this one, and it felt a little thin to me. It didn't hurt the story, though. It made it a good, quick read for reluctant readers. I think the characters could have been developed more and that everything happened really quickly - which is different from the books I usually read. It's good to read different styles, and I'm glad I did because now I recommend something for younger readers, also. Also, it had some super funny scenes. Enjoy! Ok book. Wasn't really something to remember though, and the language and flow of emotions was really weird some times! The second half of the book had a confusing flow of feelings. One minute he's angry at her and in his rant he compliments her. ?? That made me reread why he was angry at her in the first place and that could be understandably, yet it wasn't written very well. Also, that part with the mom, that was a flurry of different emotions that disrupted the reading flow. This book was a bit slow to start, but once it got going I really enjoyed it. The characters were all well developed, and it touched on many issues. How to be a friend and a sibling to someone who is high functioning special needs. How to deal with the death of a parent or being abandoned by a parent. I will definitely be writing a book-talk for this one. This is a book that we can all relate to. A 13 year old boy called Zachary has just moved after his mum left him and his dad. Zachary meets this over excited boy who gets in trouble with the law quite often at first Zachary is very annoyed by him but then they find one thing they both like the trumpet and the rest is history. I found an odd disconnect between the stated ages of the main characters (14) and the way they behaved, talked, etc. The main characters seemed a lot younger. Even the cover makes it skew younger than 14. That said, it's a fun, easy read, maybe a good choice for reluctant readers at the upper reaches of the middle-grade years. This is a wonderful book for teenagers. A very nice clean read for the younger people. Well developed characters with a wonderful plot. The book was well written. This was a fun little novel that reminded me of the books I loved when I was a pre-teen. It contains a coming of age story with some lovable and believable characters, and touches on some serious themes in a lighthearted way. An endearing story with loveable characters, this book was an unexpected delight. I am definitely sharing it with my nieces and nephews. I received this book for free as a Goodreads First Read. A realistic but wonderfully hopeful juvenile book. I love that I now have this in my home library. I won this book in a First-Reads Goodreads giveaway. This is a really good book for middle-school aged kids. It's a nice easy read with a great story.